Yamaha sportboats are not only some of the best jet boats in the industry, but they’re also some of the most popular boats in the industry. With a Japanese history of refinement and a North American flare that gives these boats a reputation of quality, functionality and reliability. When it comes to fishing however, Yamaha sportboats are not the first thing to come to mind. For 2016 that is all about to change as they introduce the brand new FSH 190 Sport, a center console, jet powered fishing boat. 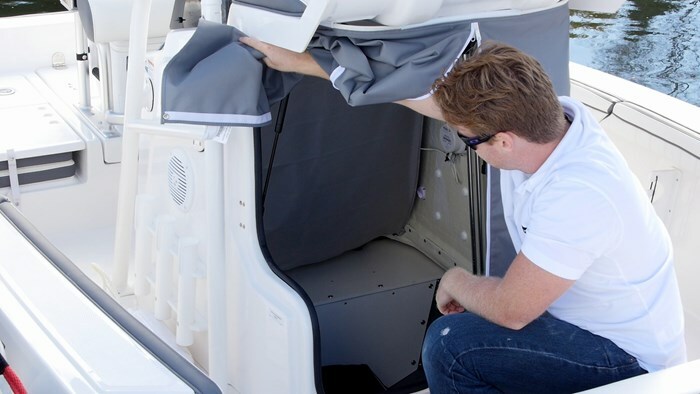 One of two new center consoles to be added to their revised line-up of 19-footers, the FSH 190 Sport is a little more tricked out than its Deluxe counterpart with the major feature of both obviously being the center console helm placement. The layout of helm is thoughtful and simple. It has a southern design inspiration behind it with all white backing, chrome bezels, a single row of rocker switches and a chrome steering wheel. It’s not without the Yamaha hallmarks such as Cruise Assist and No-Wake Mode. There is a companion grab handle that sits right behind an item tray that has the stereo right above it. Above the stereo is a large, blank space that is meant for you to flush mount your graph of choice. Knowing that fishermen like their electronics they also include lots of space on the top of the helm for more gadgets. The helm leaning post is cushioned so that it can be used as a leaning post for those short cruises but when you want to rest your feet you can hop up on top of it and lean against the two-way backrest. This means that it also flips forward so you can relax and face the stern or even fish from here. On each side of the helm leaning post are jump seats that fold up out of the casting platform. 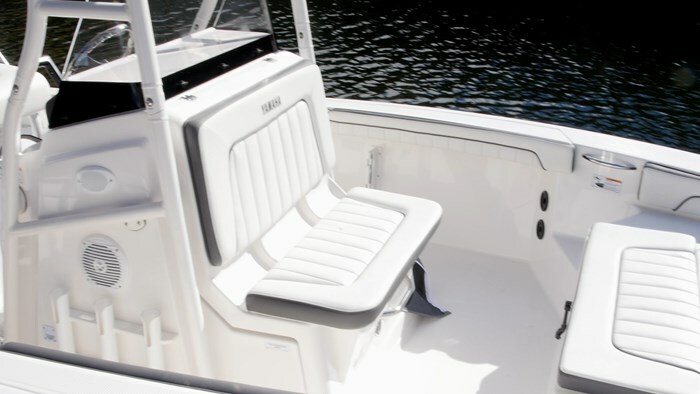 When sitting down in these seats you will notice that they are at a decent height so you can see where you’re going but also feel safe with the freeboard surrounding you. There is a small barrier separating the platform around the helm seat and to the stern platforms. Since this is meant to be more of a fishing boat, Yamaha used non-skid as a finish rather than their usual traditional Sea Deck. It is still however the low profile platform you would expect from Yamaha and while this is usually great for watersports, there is no reason why it’s not also perfect for fishing. Fishermen need to be close to the water to land fish, especially in tournament conditions which is why bass boats are low profile. So if you need to net a fish or even land it with your hand you can easily do so from the almost water-level platform. Additionally back here is access to the clean out port for the jet drive and a large wet storage bin. The FSH 190 Sport is full of refinement such as the coaming bolsters around almost the entire boat, 15 rod holders throughout including rocket launchers, storage in the gunnels and more rocket launchers on the T-top. The T-Top is one of the hallmarks of the Sport version of the 190. 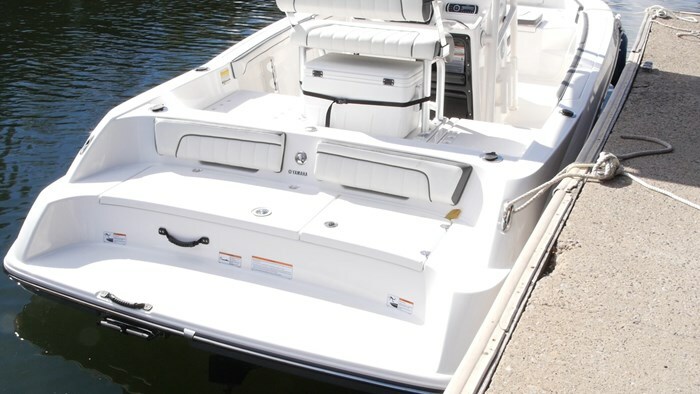 It’s a powder coated aluminum that matches the boat nicely with a bimini above to give you a little shade as well. Forward of the helm in the center console is one of my favourite features of this boat. You will see a pedestal seat with a backrest. That’s not my favourite feature, it’s what’s below it that caught my eye. If you lift up the handle that’s right below the seat the whole thing lifts up to reveal locking storage with a privacy curtain. This can be used for changing but it can also be used to stow a porta potti so there is no excuse to leave when the fish are biting. The bow on the FSH 190 is a great mix of fishing and comfort. 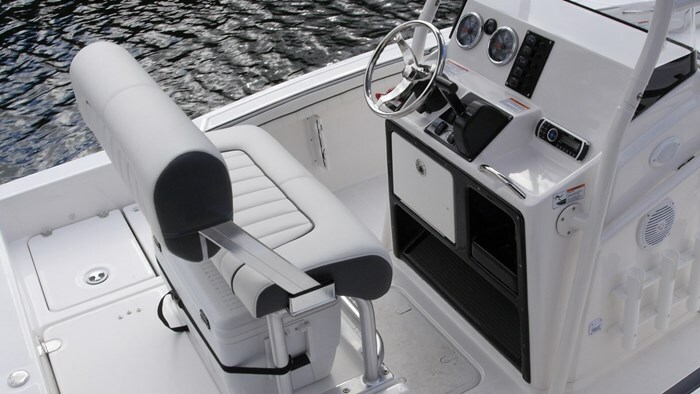 A padded seat cushion sit atop the large, insulated fishbox. To either side of the platform you will find grab handles as well as steps leading forward. There are two, barn door style storage compartments, a dedicated anchor locker and the coaming bolsters are carried forward to act as back rests for when you’re just lounging out. At 19 feet on the nose the FSH 190 isn’t the largest boat out there but it makes incredible use of space. Most of this is thanks to the low profile of the 1.8L High Output jet engine that sits down in the hull but additionally Yamaha has done things to make this boat larger than it is. They have made all the topsides, including the gunnels, non-skid. They have made them oversized so walking on them can be done safely while holding onto the T-top. So if you quickly need to get from the bow to the stern, or vice versa and someone is in your way, you can easily move past them via the gunnels. So if you’re still not sold on a jet powered fishing boat let’s think about this logically. One of the benefits of jet propulsion is the low draft and no outdrive hanging below the boat. This allows you to get into some pretty unique spots in the shallows, or areas rich with structure like logs and rocks. Where do fish hang out? Areas with structure like logs and rocks. As I idled out of the marina for the water test I was immediately impressed with Yamaha’s all new Advanced Responsive Handling System featuring their Articulating Keel. In a very general term, the Articulating Keel is a rudder that ties into the drive, but it also blends into the shape of the keel that runs the length of the boat. What this does is gives you straighter tracking, quicker response and improved handling especially at low speeds. Jets would tend to wander or drift in the past, and straight line tracking at low speed was a nightmare, but not anymore. This is a dramatic improvement from the past. Putting the throttle down the High Output 1.8L engine immediately got to work and we were on plane in just 3 seconds. This is also partly because the thrust vector of a jet is more direct than that of an outdrive, but that’s also getting way to technical for the purpose of this review. Settling into a steady cruise at 26 mph at 6500 rpm I couldn’t help but think about how right this all felt. It didn’t feel like I had to get used to the idea of a center console jet but rather the only thing that came to mind was “why didn’t they do this sooner?” It makes so much sense to have a jet powered center console to run the flats, or those inland lakes that have lots of structure and not have to worry about your propeller. Turns in the FSH 190 were precise and sharp. In the past part of the fun of jets was that they would slide out, like you could on a PWC - but that has changed. They have grown up since then and it’s all about precision, staying connected and keeping the power hook-up constant and that’s what the FSH 190 does.